Winter is here, which means so is the Winter tennis season. Whether you play outside (yes some of us do) all season or indoor there some tips that we want to share that will help the season go smoothly. Kind of stating the obvious but it’s cold, and staying warm is super important, make sure you start with enough layers on, you can always take some off when you start playing and warm up. The weather can change often and end up causing it to interfere with your scheduled court time, so be prepared, keep an eye on the weather forecast and plan accordingly. Never drive when the road conditions are bad unless you absolutely have too. You can easily take things too seriously during the colder months, so keep your sense of humor in check. Especially when you start hitting nasty shots, make a joke of it, after all tennis is supposed to be fun! Muscles respond very quickly to cold weather, if you’re not properly warmed up you’re more likely to pull a muscle or cause an injury in the Winter as opposed to the Summer time. Same thing after playing, if you go into the cold right after playing your muscles won’t recover as well as if you stretched them and cooled down correctly. Look after your body this Winter and stretch before and after playing. We burn more energy during the Winter, just because it’s cold outside. So, make sure you don’t start running on empty when you get onto the courts. Instead, keep snacks in your bag at all times to stop that from happening. 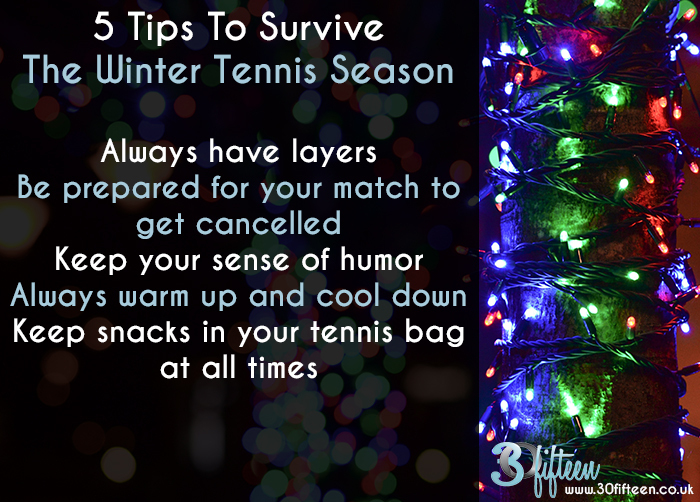 How do you survive the Winter tennis season? Share in the comments below.